This program will be very useful for senior managers or those who are responsible for KM implementation in the workplace, HR managers, competency development and training managers, librarians, IT professionals. Register before 23 Aug 2019 for 10% discount. 10% discount per person for group registration of 3 paxs or more. 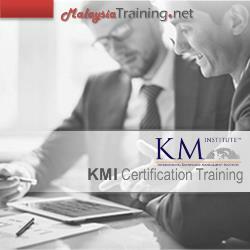 The Certified Knowledge Manager (CKM) program is KM Institute's flagship course, delivered in up to 15 countries yearly, with many thousands certified since 2001. The CKM is ideal for anyone tasked to lead or improve a Knowledge Management (KM) initiative - anyone interested in gaining a solid grasp of common KM principles at an advanced level with actual "hands-on" experience performing KM. The CKM is offered by the KM Institute in collaboration with Sharma Management International, KMI Authorised Training Partner.